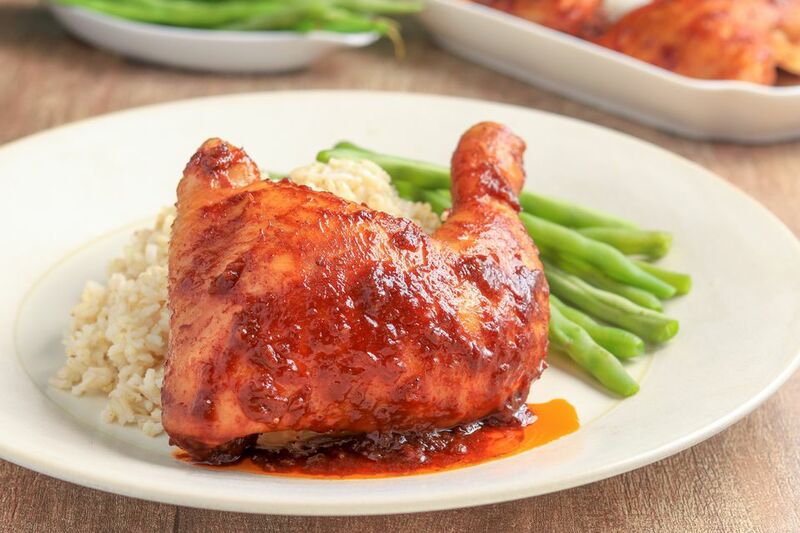 Home cooked barbecued chicken legs are super easy when you use your slow cooker. This recipe is the perfect solution for busy families, and if you prepare it in the morning, it will be ready just in time for dinner. With only two ingredients—budget-friendly chicken legs and barbecue sauce—it can't be beaten! This recipe could not be more straightforward. Just place frozen chicken legs and barbecue sauce in the slow cooker and turn on the heat. That's it! It can easily be customized to fit your taste as well. If you use thawed chicken legs, consider browning them in a small amount of vegetable oil before you add them to the slow cooker. Though it isn't necessary, browning adds flavor to the meal. Or remove the skin if you'd like to lower the fat content and calories. The recipe is a fantastic foundation to play with, and your family will love it. If you want to customize the sauce, "doctor" the barbecue sauce with some additional ingredients. For sweet-tart flavor, add a few teaspoons of mustard and about 1/4 cup of honey, maple syrup, or brown sugar. Worcestershire sauce is a great flavor enhancer for barbecue sauce as well, or add a small amount of liquid smoke. If you like your food spicy, add a teaspoon or more of cayenne pepper or crushed red pepper flakes. Or add a few dashes of Tabasco sauce, sambal, or another kind of hot sauce. If you like onions, slice a medium onion and scatter it over the bottom of the crock pot before you add the chicken. Serve these yummy chicken legs alongside mashed potatoes or a potato salad and coleslaw for a well-balanced meal. Arrange the chicken legs in a slow cooker. Pour barbecue sauce over the chicken legs. Cover and cook the frozen chicken legs on high for 4 to 7 hours, or until thoroughly cooked. Alternatively, if you use defrosted chicken legs, cook them on low for 5 to 8 hours. What is the difference between a whole chicken leg and a chicken leg quarter? A whole chicken leg is a drumstick with the thigh still attached. A chicken leg quarter is similar, but it contains some of the back, so it's a little larger. One whole chicken leg or quarter should be enough for an adult and more than enough for a child. If you use drumsticks or thighs instead of whole legs, allow about 2 drumsticks or 2 thighs per adult, or 1 per small child. For homemade flavor, use the sauce from this slow cooker chicken wing recipe for inspiration. Mix your sauce in a bowl and stir it well after adding each ingredient. Adjust the ingredients to suit your taste. Some spices intensify slightly over long slow cooking, so be sure that you do not make it too hot for people to enjoy. This homemade Southern-style barbecue sauce is another tasty option, or try this beer barbecue sauce.